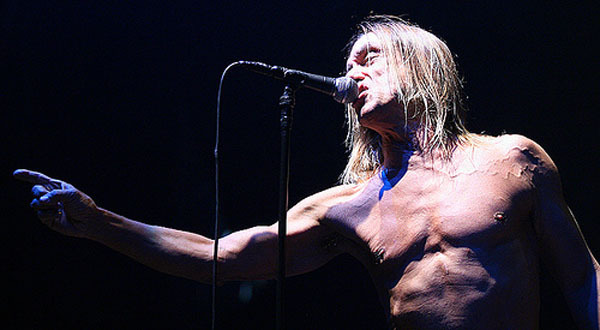 Iggy Pop has reached true legend status. A recent Carnegie Hall audience apparently believed the geriatric punk legend capable of flight and so parted to watch him take wing at a March 1st Tibet House Benefit featuring the likes of Patti Smith, Regina Spektor, and Gogol Bordello. Rather than rise to the rafters, he fell to the floor, a confused audience looking on as (according to Rolling Stone) “nobody caught him”. It’s feast or famine as far as violent rock shows go these days. Your author remembers a time when a 14 year old girl could go into a gnarly pit where she had no business being and get pulled to her feet by moshers who weren’t there to see anyone stomped. In recent years, I have seen people willfully crushed and battered by punkers who’d have had the snot beaten out of them for behaving that way at a certain time. And now we’ve reached a day when Pop’s fame has far outstretched his audience’s ability to sense that they are to put out their arms and catch the man, uselessly watching him fall to the floor. See Pop’s signature at Hanza Studios where The Idiot was recorded (it’s in Berlin) at Berlin 20/20: A Photo Tour of a Reunited City. Patti Smith more your speed? Check out Tom Gates account of his Last Show as a New Yorker before his epic journey around the world.